This instrument is especially designed to test volt-ampere characteristics, transformation ratio and polarity differences for relay protection testing current transformers. 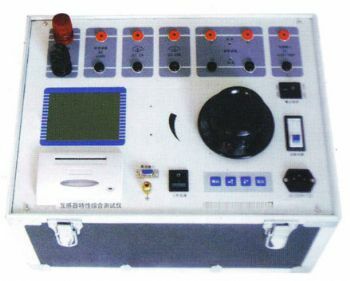 It is also used to judge the polarity of transformers, as a multi-functional instrument with excellent cost performance. The instrument takes use of transformer with special winding method, as well as high efficiency, low consume materials. Data acquisition, analysis and save is accomplished by microprocessor. The instrument is equipped with printer inside to print the test data and curves. When testing CT transformation ratio, the ratio would be automatically calculated. All the test work would be done by only one person. The instrument is featured by light, portability and easy operation. When testing CT transformation ratio, the ratio would be automatically calculated. Test result could be printed. When testing volt-ampere characteristics, the instrument allows save and print 20 groups of current-voltage information and the characteristic curves.